In stock -This product will ship today if ordered within the next 10 hours and 31 minutes. Moringa Oleifera is cultivated from the leaves of the Moringa tree, often referred to as the “miracle tree”, and grows at the foothills of the Himalayas in Northwest India. Moringa is a rich source of B-vitamins and minerals which include; Calcium, Magnesium, Iron, Zinc, Copper, Phosphorus, Potassium and Vitamins; A, C, E, B1, B2 and B3. 100% Pure Organic Moringa Oleifera Leaf Powder. Mix 2-3 teaspoons (5-10g) daily into juice, shakes, smoothies, soup or yoghurt. 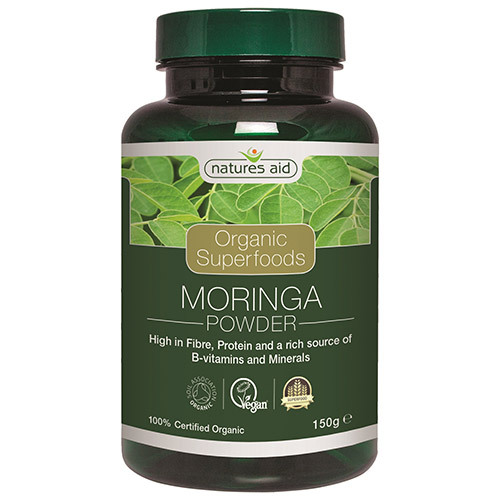 Below are reviews of Natures Aid Organic Moringa Superfood Powder - 150g by bodykind customers. If you have tried this product we'd love to hear what you think so please leave a review. The Moringa Superfood powder has a good taste but it is hard to mix it with iced tea.